The Victorians glorified the hero Gordon of Khartoum. But the reality was considerably less clear-cut. In the early hours of Monday, January 26th, 1885, Major-General Charles Gordon was killed by Mahdist forces overrunning Khartoum. There are various versions as to how he met his death. The first account to reach Cairo, although not based on the evidence of eye witnesses, described Gordon going, unresisting, to his doom. According to this version, Gordon, dressed in his uniform, a tarboosh on his head, stood at the top of an outside staircase of his residential palace, a revolver in his right hand, as Dervish soldiers scrambled up the stairs threatening him with their broad-bladed spears and swords. Four men rushed at him, and one, shouting 'Oh cursed one, your hour has come! ', thrust his spear into Gordon's chest. Gordon's response was merely to make a gesture of scorn, after which he turned round and was stabbed in the back. His assailants then hacked him to pieces with their swords. Far more authentic is the account of Gordon's death by one of his bodyguards, who was fighting beside him. In this version, Gordon was assailed by black Dervishes as he fired at them with his revolver from the top of the stairs of the palace. He forced the first group to withdraw. Although wounded in the shoulder by a spear, he continued to fire his revolver into the second group that attacked him. Finally, when his revolver was empty, he drew his sword and went for them. He was shot in the chest and knocked down, but he recovered once more and beat his enemies down the stairs again. At the bottom of the stairs a spear was thrust into his right side and he was then overcome and slaughtered. The Victorian public, many of them thirsting to revenge Gordon's death, fell hungrily upon the first version. A famous picture was produced, showing the dead hero standing calmly at the top of the steps, a revolver in his right hand and almost hidden by an upright wooden pillar, his white face disdainful as his black enemies whirl and gesticulate beneath him. This was a sanctimonious and reassuring image. It confirmed the prejudices of many Britons who saw Imperial confrontation in terms of a conflict between the forces of darkness and disorder and the upholders of Western civilisation and Christian values. The Christian imagery of Gordon's allegedly unresisting death was particularly potent, with echoes of the Crucifixion, and of the innocent lamb shedding sacrificial blood for a wider, nobler cause. It contained an uplifting message for the sentimental and the virtuous in factory, office, school, or home. On any rational analysis, it is extremely unlikely that Gordon would have chosen to go passively to his death. His character was marked by unbounded confidence in his own personal judgement, accompanied by an impetuosity which was frequently more of an embarrassment to his superiors than a comfort. He was self-opinionated, forceful, convinced that the promptings of his conscience set him above other men, and resolute in a course of action once decided upon. He revelled in the independence which his various commands had given him, and enjoyed taking decisive action. The son of an officer, having joined the army at sixteen, and becoming by thirty a highly successful captain in the Royal Engineers, Gordon went on to win an international reputation as a brilliant commander of irregular forces in the service of the Chinese emperor during the mid-1860s. Thereafter, Gordon had held a number of commands, including the Governorship of Equatoria, the southernmost province of the Sudan, between 1874 and 1879, as well as posts in India, China (once more), Ireland, Mauritius, and the Cape. He had also spent a year in Palestine investigating the sites of the Holy Places. None of these positions, however, were of first rate importance. It is clear that the British War Office did not fully trust the erratic Gordon, and were loath to employ him in any major capacity. Gordon was, in fact, something of an oddity. He was an unconventional and passionate evangelical, imbued with a personal theology which was intense, mystical and ascetic. He had been known to stick religious tracts onto walls, and even throw them out of train windows. He was much given to practical good works, visited slums, brought comfort to the sick and the dying and the old, and showed a particular interest in boys. Like two other great Imperial heroes of his time, Kitchener and Cecil Rhodes, Gordon was a celibate. What this almost certainly meant was that Gordon had unresolved homosexual inclinations which, like Kitchener, but unlike Rhodes, he kept savagely repressed. The repression of Gordon's sexual instincts helped to release a flood of celibate energy which drove him into weird beliefs, eccentric activities, and a sometimes misplaced confidence in his own judgement. For example, Gordon believed that God's throne rested literally upon the earth, which was in its turn enclosed in the firmament, that the Garden of Eden was on the bed of the sea near the Seychelles, and that most of the sites of the Holy Places in Jerusalem had been wrongly identified. It was doubtless his capacity for independent and eccentric thought, his taste for isolated command, and his almost messianic qualities (he had piercing, unnaturally bright blue eyes, filled, some people thought, with the 'beauty of holiness') that made his military and political superiors wary of entrusting him with really important assignments. Why, then, was Gordon sent as Governor-General to the Sudan in January 1884? An examination of this question reveals a great deal about the pressures of public opinion, the role of the press, the confusion and uncertainties prevalent in Government circles, and the impact of personality and friendship upon the decision-making process. Well before Gordon's appointment, the Liberal Government had got itself into a mess over the Sudan. Although Gladstone's passionate attacks upon Disraeli's misadventures in the field of foreign and imperial policy had, it was widely believed, helped to win the 1880 election for the Liberals, within two years of this triumph the new government had sanctioned the invasion of Egypt. The British military intervention in Egypt in 1882, carried out in principle to protect the Suez Canal as an international waterway, established a presence there that was to endure until the abortive Suez invasion of 1956. But the establishment of British paramountcy in Egypt also involved her in the affairs of the Sudan to the south. From 1882, the year of the British invasion of Egypt, the Mahdi, a messianic Moslem leader, dedicated to a Jihad, or holy war, to cleanse Islam of its impurities, had united various groupings in the Sudan and threatened the whole basis of the Egyptian overlordship there. In 1883, in an attempt to restore the Khedive's authority, a raggle-taggle army of Egyptian troops led by a retired Indian Army colonel, Hicks Pasha, had been annihilated by the Mahdi's forces. As more and more Egyptian forces fell back upon Khartoum, at the junction of the Blue and White Niles, the British government came under considerable pressure to solve the crisis. There was no clear-cut solution as to the best course of action. Many Liberals would have preferred, in principle, to have abandoned the Sudan and even to have withdrawn British forces from Egypt. Moreover, though disliking the slave trading of the Sudan, many Liberals would also have supported Gladstone in his assessment of the Sudanese as a people struggling to be free. The Conservative opposition argued against a withdrawal from Egypt, and were prepared for an effective assertion of Egyptian authority in the Sudan as a strategic safeguard for Britain's need to protect her interests along the Canal. Do you see any objection to using Gordon in some way? He has an immense name in Egypt - he is popular at home. He is a strong, but sensible, opponent of slavery. He has a small bee in his bonnet. Gladstone, despite an intense dislike of Gordon, based apparently upon instinct rather than first-hand experience, was prepared to float the idea. On December 1st, Gladstone asked Evelyn Baring, British Agent-General in Egypt and its effective ruler, whether Gordon would be 'of any use to you or to the Egyptian Government, and, if so, in what capacity.' Since Baring had a few days earlier recommended to the British Government that the Sudan be evacuated, any usefulness that Gordon might have would clearly be linked to the supervision of such a withdrawal. Clearly the Government were hoping that to involve Gordon in the solving of the Sudan crisis would placate public opinion, and at the same time were inclined to think that Gordon's own reputation in the Sudan was sufficiently high to achieve success. In Egypt, Baring was determined not to have Gordon thrust upon him, fearful of his unpredictability and his tendency to disregard his orders. We cannot send a regiment to Khartoum, but we can send a man who on more than one occasion has proved himself more valuable in similar circumstances than an entire army. Why not send Chinese Gordon with full powers to Khartoum, to assume absolute control for the territory, to treat with the Mahdi, to relieve the garrisons, and to do what he can to save what can be saved from the wreck of the Sudan? Most of the press enthusiastically fell in behind Stead's journalistic lead. Events now moved at great speed. General Gordon would be the best man if he would pledge himself to carry out the policy of withdrawal from the Sudan as soon as possible, consistent with saving life... I would rather have him than anyone else, provided there is a perfectly clear understanding with him as to what his position is and what line of policy he is to carry out. On January 16th, Gordon went to Brussels to disentangle himself from the agreement he had previously made with King Leopold of the Belgians to represent him in the Congo, leaving his would be employer 'furious'. His path to the Sudan, however, had now been cleared of its remaining obstacle. The mission which he was going to undertake was only to be undertaken with such resources as he might find on the spot, and that there would be no British expedition for the relief of Khartoum or any other garrison in the Sudan. Just before eight o'clock in the evening of January 18th, 1884, Gordon boarded a train bound for Dover at Charing Cross. His departure was as slapdash and confused as the terms of his appointment. Lord Granville bought his railway ticket, Lord Wolseley carried his bag along the platform, and the Duke of Cambridge, the Commander-in-Chief, opened the carriage door for him. His uniform-case arrived just before the train left. But he discovered that he had no money, nor a watch, so Wolseley handed him his own watch and chain and all the money he had in his pockets. In the year between his hasty and undignified departure for the Sudan and his death, Gordon was engulfed in a confused and deteriorating situation, for which both he and the British Government must bear considerable responsibility. Despite his undoubted capacity for brisk military leadership in the Sudan, Gordon found that, progressively, the options open to him were reduced as the Mahdist forces achieved more and more success. In the end he had no choice but to withdraw into Khartoum with the Egyptian garrison and the administration. The British Government then criticised him for failing to carry out one of the few fully agreed instructions that he had taken to the Sudan, namely to supervise an evacuation without asking for British military assistance. It was also plain that the Government expected him somehow to establish a self-governing state in the North Sudan. These agreed instructions were both optimistic and vague. There is, however, much evidence that Gordon tried hard to fulfil them. Some Egyptians were evacuated, and he tried to bring back some deposed traditional Sudanese rulers, including the notorious slave-trader Zubair, whom he had himself earlier deposed. Gordon would perhaps have been better served if he had made withdrawal his foremost concern. But his attempts somehow to reconstruct alternative Sudanese rule as an obstacle to the Mahdi meant both that he delayed withdrawal and also that he precipitated a determined and full-scale Mahdist assault upon Khartoum. At the same time, he deluged London and Cairo with telegrams reflecting his own shifting, assertive and sometimes contradictory views of events as they unfolded in the Sudan. In the process he seemed to confirm the misgivings of those who found him obstinate, erratic and manipulative. His behaviour also prompts the question, unanswerable though it is: was he consciously, or even unconsciously, seeking his own death or at least making his eventual martyrdom more likely? At any rate, a government that had appointed him with much trepidation now became exasperated. Back in Britain, as the odds against Gordon supervising a successful withdrawal lengthened, the Gladstone government dragged its feet over the sending of a relief expedition to the Sudan. Partly this was due to the Government's consistent reluctance to spend money on foreign adventures; partly it reflected the Cabinet's irritation at Gordon's failure to ban slavery and his apparent defiance of his agreed instructions, especially to withdraw; and partly it reflected the Government's uncertainty as to what to do for the best. Gladstone's administration was an uneasy coalition of conservative Whigs, mainstream Liberals, and Radicals - of whom the foremost member in the Cabinet was Joseph Chamberlain. There were no Cabinet minutes kept, and Gladstone was neither able to conduct Cabinet business efficiently nor to communicate his views with unfailing clarity to his colleagues. Very often Cabinet meetings produced indecision and vacillation, and after a while the Prime Minister decided to summon as few as possible and thereafter tried to conduct the Government's business by a wearisome process of personal contact and intervention. This in turn contributed further to ministerial misunderstanding and divisions, and left the more independent spirits in the administration free to pursue their own policies. As if this were not enough, in Gordon, Gladstone, who had a morose inclination towards self-pity and masochistic selfmortification, had found an exquisitely painful stick with which to beat his own back. It was symptomatic of the whole unhappy affair that, although a relief expedition was at length sanctioned, it was not until September 25th, 1884, that Wolseley, its Commander, was given the formal orders to go ahead. As the relief expedition made its way slowly up the Nile, the Mahdist forces moved inexorably upon Khartoum. Gordon, however, remained optimistic, and in one of the last messages from him received by the relief expedition, dated December 29th, 1884, said: 'Khartoum all right, could hold out for years'. Misled by this typically over-optimistic message, Sir Charles Wilson, an intelligence officer in charge of the expedition's advance guard, decided to obey orders and stay put, while establishing a base and making contact with Gordon. It was not until the morning of January 24th, 1885, that Wilson, with two steamers, set off upstream for Khartoum. On January 28th, the crew of the leading armed steamer saw Khartoum in the distance. As the steamer paddled towards the distant silhouette of the city, rifle bullets and the occasional shell were directed at it. At last the outline of the palace itself could be seen. There was no flag flying from its roof, and at the river's edge hundreds of Sudanese crowded, exultant, beneath the banners of the Mahdi. The expeditionary force had arrived three days too late. On February 5th, news reached London that Khartoum had fallen, and that Gordon was dead. A frenzy of public mourning ensued. Pictures of the dead hero, draped in black, appeared in countless shop windows, and not merely in Britain, but also in Paris, Berlin and New York. Queen Victoria sought out her lady-in waiting to tell her in grief-stricken tones, 'Gordon is dead!' She expressed her outrage more formally by sending Gladstone an angry telegram. Gladstone himself was reviled as the 'Murderer of Gordon', and stones were hurled through the windows of 10 Downing Street by incensed patriots. Far away in South Africa, Cecil Rhodes repeatedly bewailed the fact that he had not been at Gordon's side when disaster struck. Gordon songs and Gordon poems poured from the printing presses. Soon, all over the country, Gordon memorials were being unveiled, and Gordon Boys' Clubs were being opened. During the decade after his death, over twenty-five books, and a far greater number of pamphlets and articles, were written to his glory. In the House of Commons on February 23rd, 1885, the Conservative opposition moved a vote of censure upon the Government's record in the Sudan and upon the 'betrayers of Gordon'. In the long, ensuing debate, which surveyed the Government's Egyptian policy since 1880, the clear divisions amongst the Liberals were cruelly exposed. The Sudan fiasco was yet another issue which, like Irish nationalism and the need for social reform, set Liberal against Liberal. Despite the outrage and indignation expressed in Parliament, however, there was little overall agreement as to what to do next. Generally, MPs agreed that the entanglement in Egypt and the Sudan was hazardous and unsatisfactory, though few were confident of the best solution to the problem. The Government narrowly won the vote of censure on the Sudan, and survived for four more months, in considerable disharmony, chiefly to see through the Distribution of Seats Bill. In April 1885 the Cabinet was confident enough to revert to its former policy of withdrawal from the Sudan altogether. When, in June 1885, the Conservatives took office, they showed themselves no keener than the Liberals to reconquer the Sudan and avenge Gordon's death. Essentially, the new Government looked, like its Liberal predecessor, to the eventual complete evacuation of British forces from a solvent and settled Egypt. In view of the passionate feelings aroused, and the hard words said in public, it was ironical that Britain made no move to reconquer the Sudan until 1896, eleven years after Gordon's death in Khartoum. The plain fact was that the Mahdist state filled a potential power vacuum in the Sudan, keeping the interests of other European powers at bay. The Conservative leader Lord Salisbury, indeed, even said of the Sudanese, 'These people were created for the purpose of keeping the bed warm'. Only when it appeared that a serious French threat, possibly backed by Russia, was developing to the strategically important region of the Upper Nile, did Britain move against the Sudan. 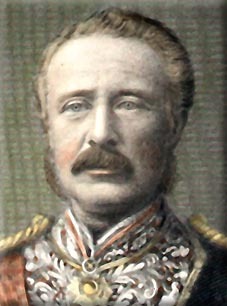 Kitchener's reconquest, culminating in the Battle of Omdurman and the fall of Khartoum in 1898, was, for many, the final revenge for Gordon's martyrdom. Although essentially a mere post-script to the partition of Africa, Kitchener's ponderous, implacable and relatively efficient invasion of the Sudan was in sharp contrast to the confusion and double-dealing that had marked Gordon's mission fourteen years before.